Almost 200 SEIU Healthcare nurses attended our inaugural Nursing Leadership Assembly at the Hilton Mississauga Meadowvale Hotel on March 25, 2019. All nurses follow professional practice standards, yet nurses are facing numerous challenges that can impact the delivery of quality patient care. Our members heard from guest speaker Michael Etherington, an Indigenous Relations Consultant, who discussed, “Building Meaningful Dialogue About the Truth and Reconciliation Calls to Action”. Stephanie Staples, a nurse and specialized psycho-social employee-wellness and workplace-health services consultant for Health Canada, spoke about actions you can take to eliminate burnout in your workplace and ways to live a more fulfilling life. Some of the Nursing Wave team members shared their touching stories regarding the struggles they face in their workplaces such as unreasonable workloads, a lack of full-time nursing positions, and workplace violence and harassment. 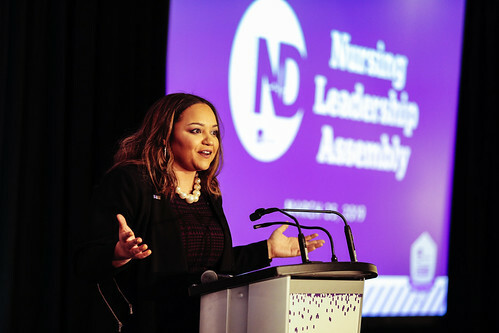 These nurse leaders and Nursing Division President Jackie Walker proposed meaningful ways SEIU Healthcare can take action to start resolving some of the critical issues affecting nurses and the healthcare system as a whole. The regional break-out sessions were a great opportunity for nurses to start planning their in-unit Nursing Week events. Nursing Week is May 6 to May 12 this year and you can start planning your event using our event organizer. SEIU Healthcare nurses can find out more about the Nursing Division and resources for nurses at seiunurses.ca.